My twenty-first stadium of 2014 was on Saturday 25th October at Fenland Stadium in Wisbech, Cambridgeshire. 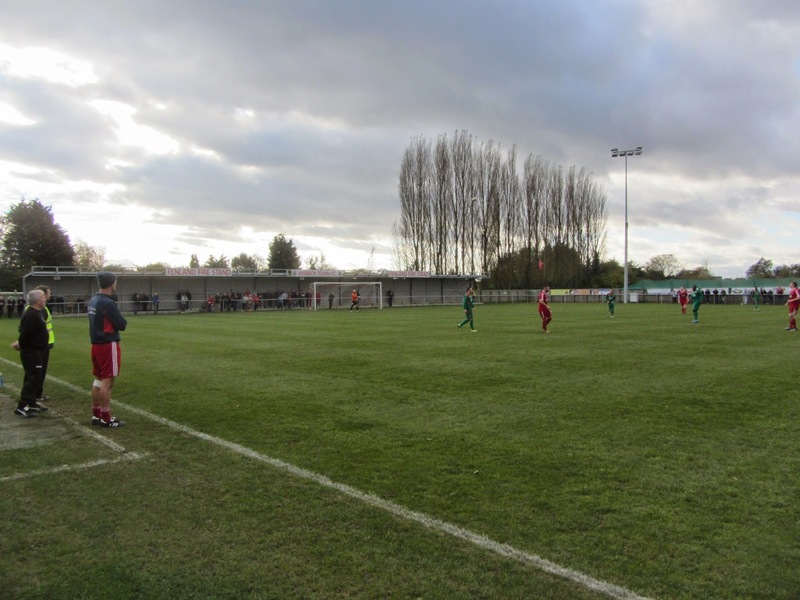 The match was Wisbech Town vs. Thurnby Nirvana in the United Counties League Premier Division. Fenland Stadium was opened in August 2010 as a new sports complex built in the north-eastern outskirts of Wisbech. 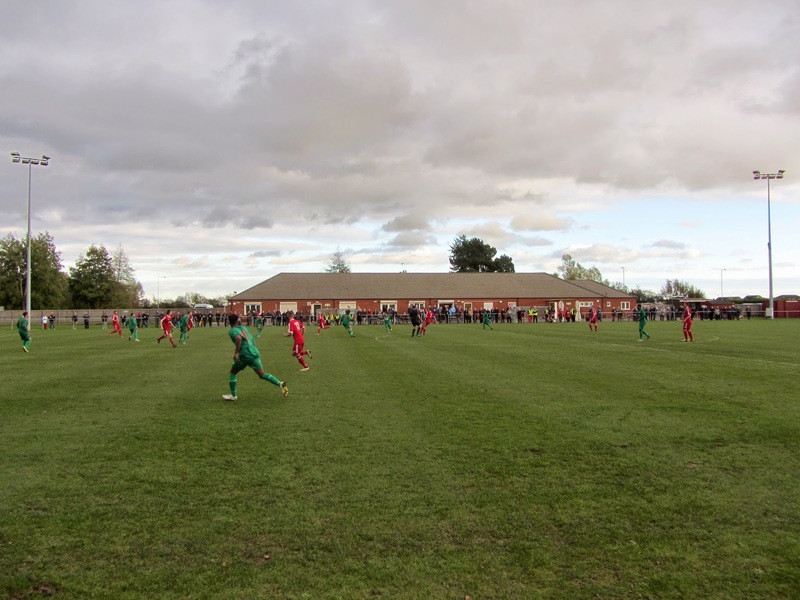 Before moving the club had played at Fenland Park from 1947 until 2008 - at this point Wisbech Town entered a groundshare agreement until they were able to move in to their new home two years later. The nearest railway stations are at March and Watlington, each around 10 miles away, though stations further afield at King's Lynn and Peterborough offer better public transport connections. The eastern side of the ground has the only all-seater stand in the venue - the 113 seat structure is covered and split into small sections. 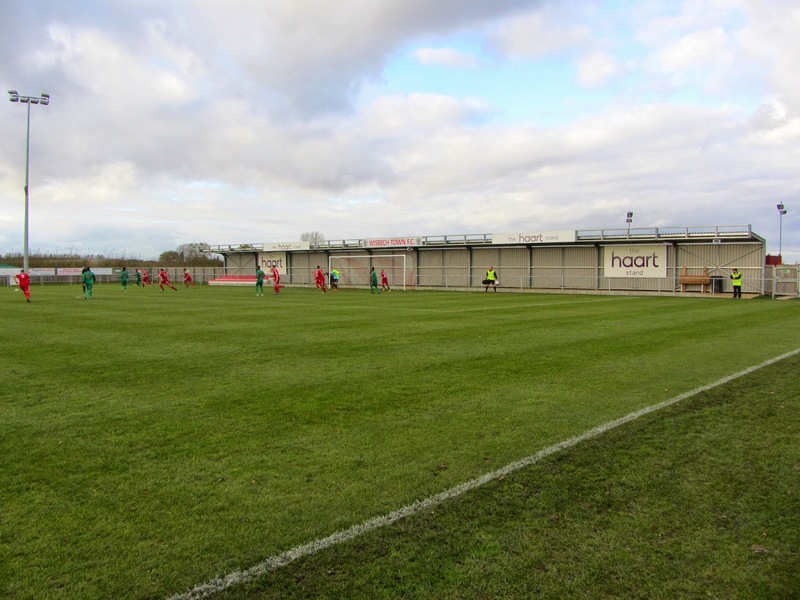 The other two stands at Fenland Stadium can be found behind the goals at the northern and southern ends - both of these are raised hard standing under a metal roof. 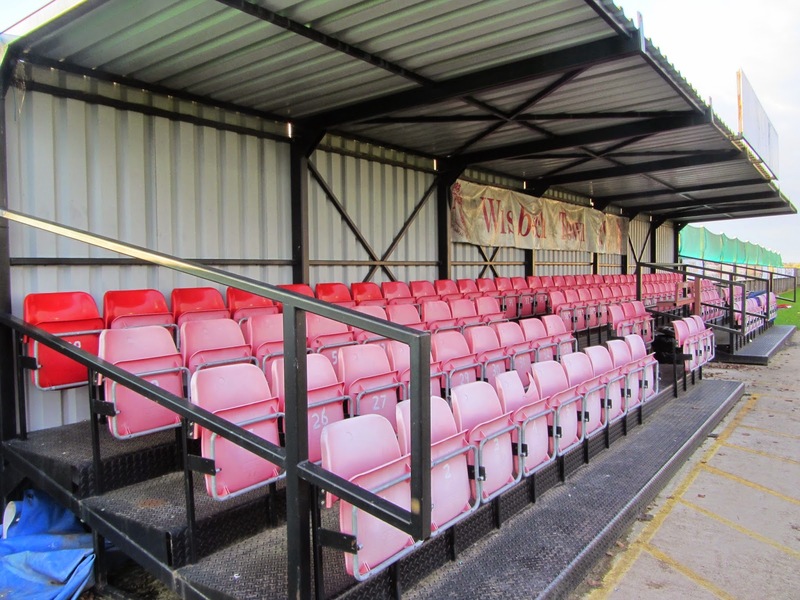 They also include some form of seating with small wooden bench sections drilled into the western ends of the stands. The northern stand also has an additional seated section for 51 plastic bucket seats on top of concrete mounting. The remainder of the ground is uncovered standing. On the western section of the stadium is a large building housing a large clubhouse, dressing rooms and toilets. Adjacent to this is a converted shipping container which contains the club shop. The two dugouts are also situated on the western side of the ground. The first goal only took 90 seconds to arrive as Thurnby's Liam Canavan whipped a 30 yard ball over the head of Lea Jordan in the Wisbech goal and into the net back of the net. The visitors doubled their lead in the 17th minute - a ball upfield had resulted in a collision between several players and when the ball cannoned off Matt Melbourne it squirmed past Jordan and trickled into the bottom corner. Thurnby dominated the opening 30 minutes and should have been well out of site by the time they allowed Wisbech a foothold in the game when Jon Fairweather reduced the arrears by poking home a corner. Just a couple of minutes later Thurnby's two-goal cushion was restored as Celson Patrocinio raced down the pitch and lifted the ball over the advancing keeper to make it 3-1. Yet more chances were spurned by Thurnby and shortly before the break they conceded again when Adam Millson drilled home from close range after a shot was headed off the line. After somehow remaining in the game Wisbech were much improved in the second period and took only 30 seconds to restore parity - Danny Beaumont was left in acres of space on the left hand side and calmly controlled the ball before smashing past James Flinders in the Thurnby goal. Despite pressure from Wisbech it was the visiting team who again got their noses in front in the 70th minute as Liam Canavan headed in a cross for his second of the game. It was looking like Thurnby had done enough to leave with the points but in the 89th minute the ball found its way to Steven Reid on the edge of the Thurnby box - Reid unleashed a half-volley which flew into the top corner to save a point.